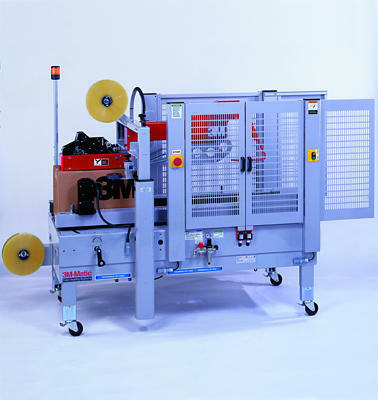 Automatically folds top minor and major flaps and tightly seals cases with 36 mm to 72mm tape at up to 28 cases per min. Spring-loaded drive with twin gear motors for heavy-duty performance. 3M AccuGlide II Taping Heads included. •Consistent durable case taper that manually adjusts to handle multiple box sizes and offers top flap folding. •Rugged corrosion resistant construction with 16-gauge welded stainless steel frame and powder coat paint finish. •Side belt drive for positive box conveying. •Case sealing, box sealing, automatic upper flap folding.